This pack includes CAT C15, CAT 3406, Cummins ISX and Detroit Diesel 60 Series engine sounds. For use with Modified Peterbilt 1.9 and 2.0 (probably). Tested on version 1.22. Jakebrake problem is now fixed. Please respect my download link, don’t reupload it anywhere. Is this a new Detroit Series 60 sound? it sounds different. I like. Yeah, nobody besides Kriechbaum has ever done decent DD60 sound mod, so i tried to make one myself. Probably it’s not final version and will be updated in the future. Very nice. I was waiting a long time for a new Detroit sound. 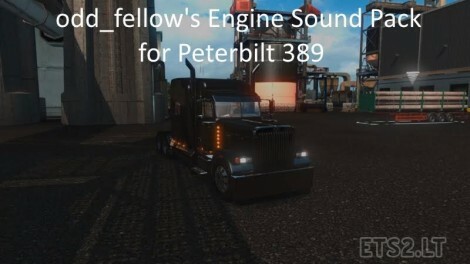 Do you mind if I make a mod for the Freightliner Classic XL and FLD with your Detroit 60 sound? (only the Detroit sound). I will mention you in the credits. Freightliner and Detroit goes together and I would like to have your sound in them. OMF! A proper Cummins N14 sound would be geat. Great job on the sound on the Series 60 and the jake brake fix it adds a lot more to the driving experience.